This configuration section cannot be used at this path….!!?? By default within Windows 7 IIS 7.5 Microsoft has locked down the parent security requiring that you explicitly allow certain functions for them to be overridden by using either the IIS interface or by your apps web.config file. 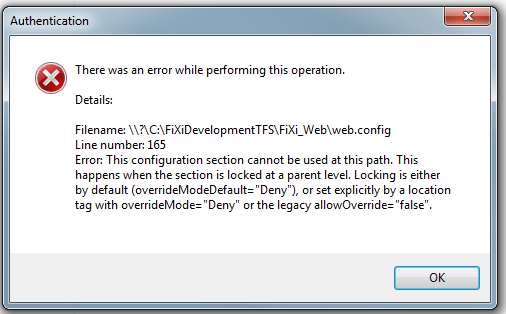 For example I received the following alert in IIS when my web.config file had “Anonymous Authentication” turned on. This alert is displayed when trying to manage the authentication settings within IIS. One Response to This configuration section cannot be used at this path….!!? ?